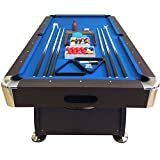 POOL TABLE 8FT Model VINTAGE BLUE FULL OPTIONAL 8FT Playfield 88 in. L x 44 in. W SOLID AND STRONG The product is new and packed PROFESSIONAL SIZE The table size are professional 8 feet (Playfield 88 in. L x 44 in. W). Billiards Professional dark brown, blue cloth and chrome inserts on the four extreme corners. 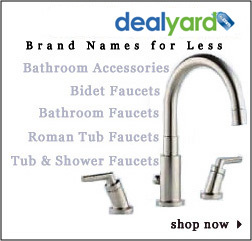 Ideal for entertaining friends in the evenings. Package dimensions a box: 102 in. X 54 in. X 10 in. – WEIGHT 339 Pounds. Billiards Pool Table Brush and cloth set is very useful. 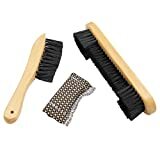 This set contains 2 brushes, one brush to clean billiard rail and the other can clean the corner of the billiard corners. Soft nylon bristles can clean dust very well without scratching billiards. The billiard cloth can clean dirt or oil and prevent chalk from hurting the wood and burnish for longer using time.